Cannes is a commune in France, located in the department of Alpes-Maritimes and the region of Provence-Alpes-Côte d'Azur. Cannes is one of the best-known cities of the French Riviera, famous for the International Film Festival and the glitzy hotels, cars, beaches, and visitors. Cannes is 36 km from Nice, 55 km from Monaco and 60 km from the Italian border. From this elegant city, it's an easy drive to the other star attractions along the French Riviera. Enjoy the plunging cliffside scenery on one of the corniche roads as you head for Monte Carlo. Or perhaps visit Antibes with its lush, bougainvillea-draped villas, or the medieval walled town of St. Paul de Vence. Port Location – The port is located in downtown Cannes. Travel Links – The nearest international airport to Cannes is Nice Côte d'Azur Airport located seven kilometres west of Nice. Shuttle buses to this airport run every half-hour from 8 AM to 8 PM, with a travelling time of 30 minutes. Taxis are available at the airport. The city is also served by the small Cannes - Mandelieu Airport, which caters mainly to general and private aviation. Trains operate daily between Cannes and Paris, Barcelona, Milan and Genoa. The TGV provides both inter-regional and regional trains with the high-speed train connecting Cannes to Paris, taking about five hours. 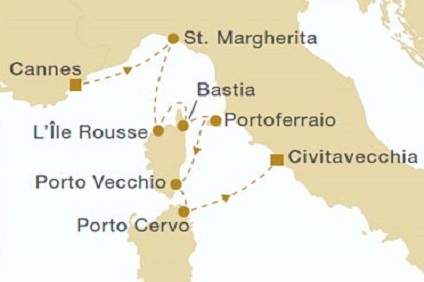 Alternatively, there are ferries connecting Nice and Corsica and ferry services to Mediterranean destinations operate from Antibes, which is 30 minutes away by train. 7 Night Cruise sailing from Cannes roundtrip aboard MSC Seaview. 7 Night Ligurian Sea cruise departing from Cannes roundtrip onboard Royal Clipper. 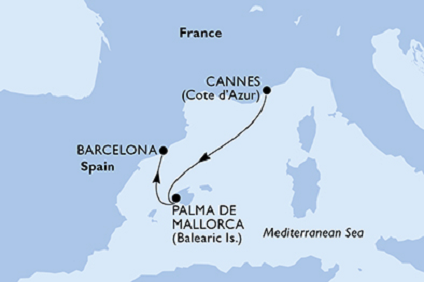 2 Night Cruise sailing from Cannes to Barcelona aboard MSC Seaview.